As a Burnaby resident and transit user for the past 8 months, I must admit that I, perhaps among others, have been bothered by the lack of structure in Burnaby’s bus transit network. It’s evident if you ever have a look at a map of Vancouver’s transit system and Burnaby’s transit system. 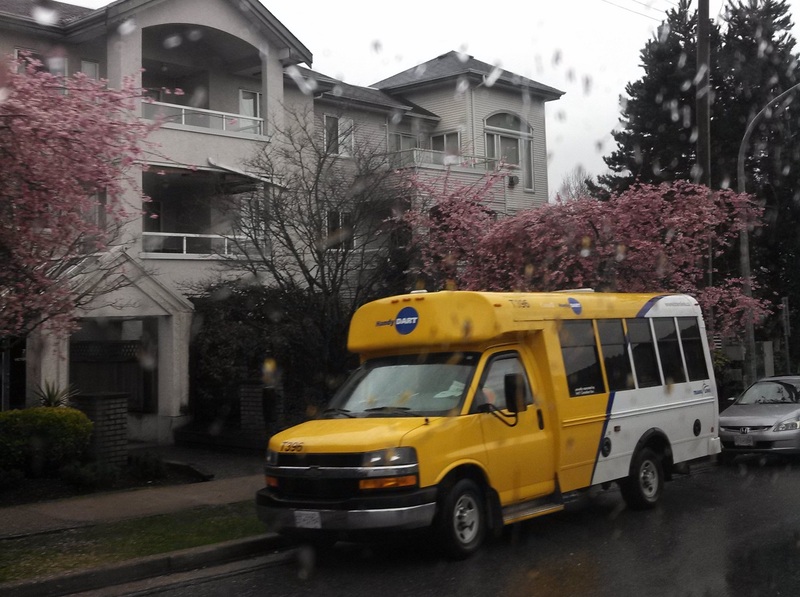 Notice how Vanouver manages to conform to a standard grid – but once Boundary Road is crossed, the grid gives way to a series of indirectly routed buses that twist and turn along Burnaby’s many local streets. There’s some coherency in the form of the busiest and most popular routes crossing the city (the 25, 106, 123, 129, 130, 135 express) but most of the routes swerve around the city in a non-gridlike fashion, and are unable to manage frequent transit network (FTN) service levels. 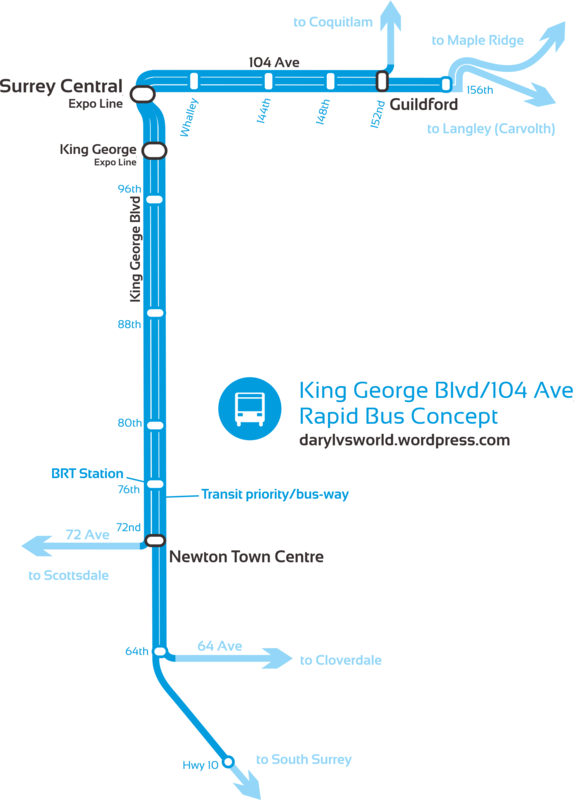 For example, through travellers from Kingsway to Edmonds St and 6th Ave on the 106 face a lengthy detour as the bus detours to reach Edmonds SkyTrain Station. And, you betcha, that lack of a through connection on the C5 from Royal Oak Station to Kingsway (where there are businesses, including a major grocery store) and points north is an annoyance. The winding state of many routes also makes commutes much longer – as such that if I want to travel home from – say – the bowling centre near Holdom Station, I’ll usually take the SkyTrain the long way around. This is often faster than timing the 129 and then actually taking it, but still much slower than if I could drive. Network gaps and limitations like this are a serious impediment to transit ridership growth in Burnaby. According to TransLink, capacity utilization of Burnaby and New Westminster’s buses dropped 2.6% in 2012 – and it was the only area of Metro Vancouver where this value dropped. Cost per boarded passenger decreased – but did so at a lower rate compared to other areas of Metro Vancouver, exceeded by only the North Shore area where it rose 1.2%. Many of these bus routes were initiated with the introduction of Expo Line service in 1986, and received minimal redesigns with the introduction of the Millennium Line in 2002, probably not helped by the major transit strike that occurred just 1 year prior. There have been a few changes since that I feel have been particularly good, such as the current C5/C7 service in South Burnaby (which apparently replaced a number of bus routes that ran less frequently and not in both directions), but there are still a lot of gaps in the service. I would like to see a regular service down Imperial Avenue east of Kingsway, but instead riders are currently being forced to walk long distances to access their bus. The local transit network in the southeast corner of Vancouver, in all of Burnaby, and in all of New Westminster is poorly integrated with rapid transit and with other local transit. The loopy patterns are similar throughout, and they are inherently indirect and infrequent and slow. Nearly all routes currently run every 30 minutes off peak. Bus routes should run primarily on arterials perpendicular to rapid transit and connect at the stations. They should cross the city so that connections are possible at Hastings, the Millennium Line, the Expo Line, and at Marine. There should be fewer routes that are more direct and have higher frequency. 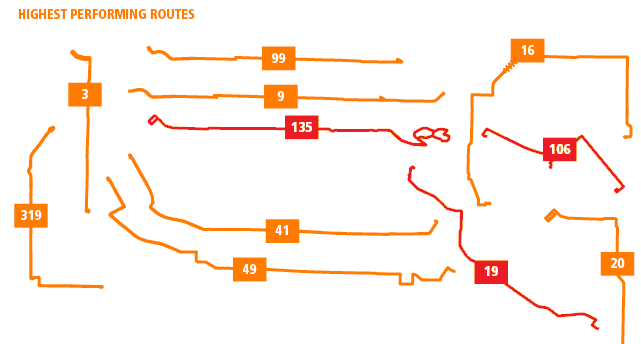 The image [above] shows a network in which most of the routes run better than 15 minutes off peak and all of the routes run at most every 20 minutes off peak. This is possible just be redistributing service without any increase in cost. The last line captured me before I clicked on the full-size image because I see this as a value riders do consider important and may consider in their favour when discussing changing Burnaby’s transit network. This isn’t the only concept I’ve seen. 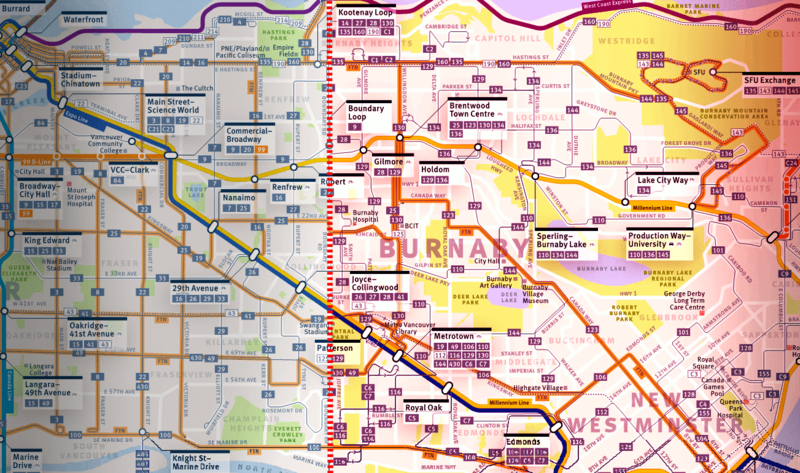 Blogger Kyle Zheng (257van) also put together an impressive concept for Burnaby’s bus network in late 2012. In my proposal, I have determined that there are overlapping services, and many places with extremely lacking services. By removing bus routes, higher frequencies may be achieved. This though, will decrease the coverage level (eg: I have removed the 116). From my analysis, the higher frequencies and less routes in my proposal will save money, or at least cost less than the current system. There’s a useful point-out of which routes have what frequencies (8 or better, 15 or better, or above 15) during a mid-day time point just before the PM peak, which shows us that many of the current routes/corridors simply do not manage 15 minute off-peak frequencies. The whole plan is based on a “bus skeleton” basis of focusing on frequency and simplification. The proposals manage to give the entire network a 15 minute off-peak frequencies. The proposal also comes with a fully costed business case analysis, which analyzes the cost of providing the current and proposed bus networks (it seems that Mike’s proposal has also been included in this analysis). All in all, it checks out: many Burnaby residents receive a 15-minute off-peak bus service in return for routing changes, and it’s possible within existing budget limitations: it doesn’t cost TransLink any (or much) more money to do this. TransLink’s highest-performing routes. 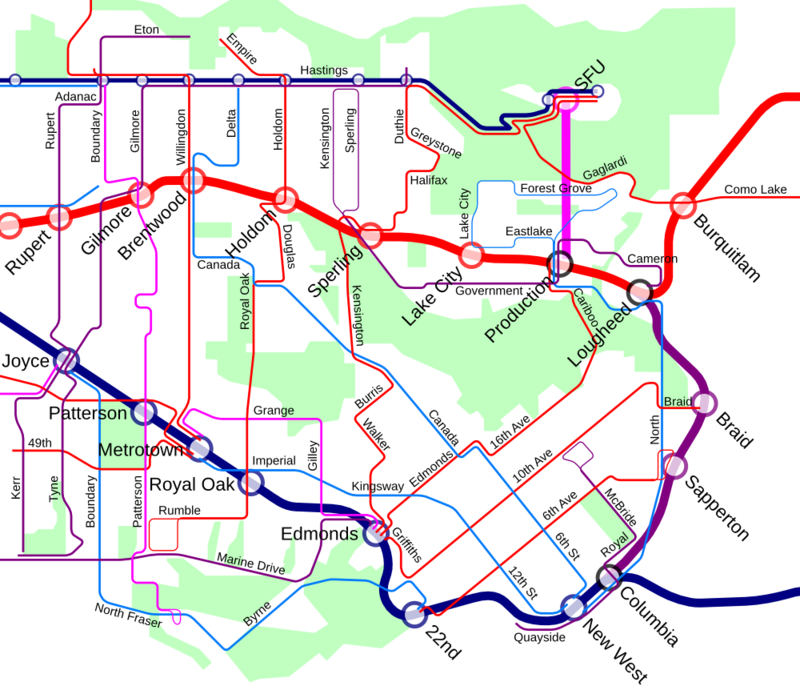 The routes highlighted in red service the City of Burnaby. Unfortunately, all proposals have their flaws – and these ones are no exception. Both of the concepts are impressive in that they try to get all services to improve in frequency, but such improvements can often come at a cost to mobility. In Mike’s proposal, many areas lose their direct connections with important travel markets and anchors. For example: services cease to exist where the 110 currently runs north of Metrotown Station, cutting off service to a major local travel anchor (Burnaby Central Secondary School – a very large school that hosts special programs not found in other schools) in addition to Central Burnaby residents in general. It would also limit connections to Burnaby’s City Hall and Art Gallery from the rest of the city and region. Burnaby Central Secondary School is newly built and one of the region’s largest. Under Mike’s plan, students throughout Burnaby would lose useful direct connections to this school. The proposal also eschews major, popular portions of route 106, including Kingsway west of Imperial Street and in front of Metrotown Mall; direct connections between Edmonds Station and both Kingsway and 6th Street are also cut off. I think these changes to the 106 will become a huge problem, because the 106 is one of the 10 most cost-effective routes on TransLink’s entire bus network. As well, entire corridors in New Westminster that currently see frequent, 15-minute service – including both 8th Street and 8th Avenue – are cut from service, alienating several local businesses and residents from the service that drives their sales and productivity. Entire areas are seeing a significant cut in bus service options. South Burnaby, for example, loses a lot of the service coverage provided by the C5, C6, C7 and 116 in favour of just one service that seems to replicate what existed before the C5 and C7 were created. Riders have less choice, and it is not as easy to travel to places like Metrotown. All in all, the more frequent service comes at a cost: new walking distances to buses in some instances exceeds 10 minutes – something that could become particularly problematic for disabled transit users, as well as senior citizens. In Kyle’s proposal, much of the existing bus network coverage is actually retained, but there area number of obvious flaws: the first that stood out to me being the removal of the C5 – a popular transit link from my station of residence (Royal Oak). 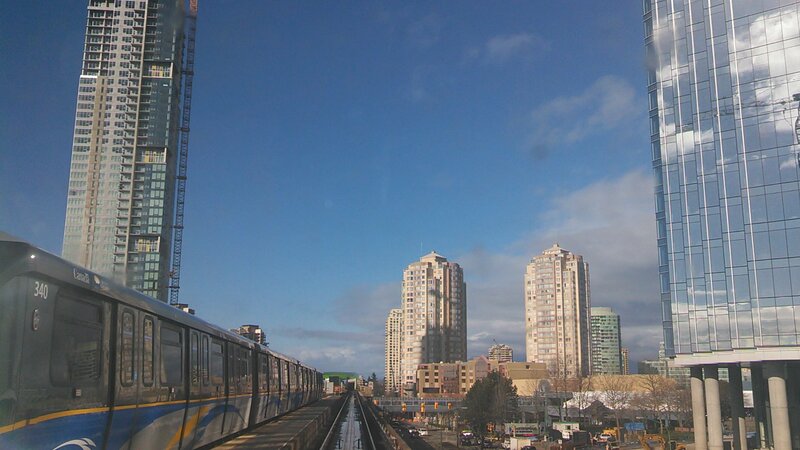 Not only does the plan limit an otherwise quick connection with SkyTrain for South Burnaby residents, but the whole plan prevents South Burnaby area commuters from making any connection to Marine Drive (route 100) and South Vancouver altogether, unless they travel to 22nd Street Station. In many of the proposals, connections with major anchors are compromised. Proposals 2 and 3 cut 8th Street service, as with Mike’s proposal, limiting connections to Douglas College, New Westminster Secondary and many local businesses. In some instances, major anchors are just barely missed; proposal 1 has a great bus route going down Royal Oak that could offer a connection to Metrotown or Royal Oak, but this is eschewed in favour of a turn on Oakland to reach Edmonds Station, which has become a centre for several routes. The 116 is also removed – which, while explicitly mentioned in his article on the matter – is done without the provision of any replacement, alienating commuters into the South Burnaby industrial areas altogether. The reason for the removal was just something I didn’t understand, especially seeing as the 116 is doing better than many of Burnaby’s less frequent bus routes, ranking 94 of 212 Metro Vancouver bus routes in terms of cost per boarded passenger. 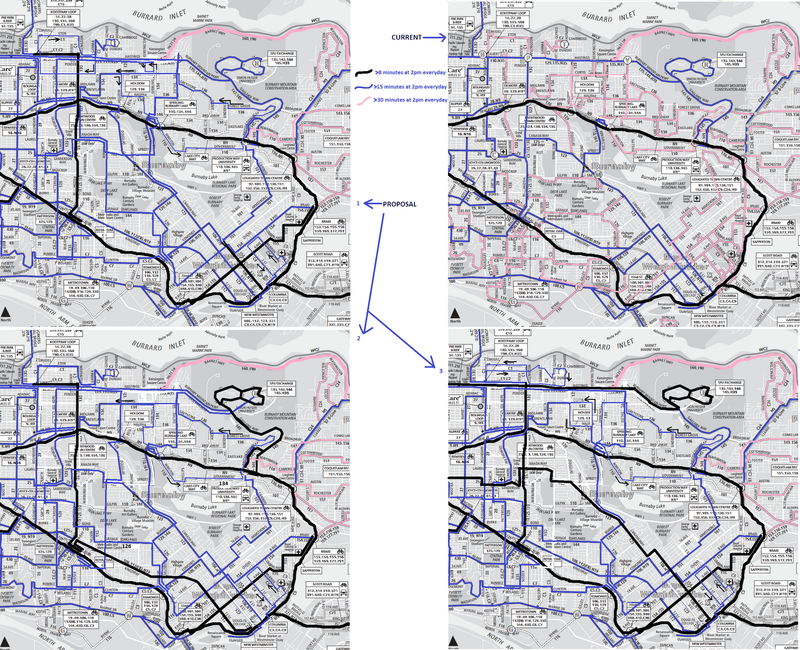 There are also a number of less optimal route choices. 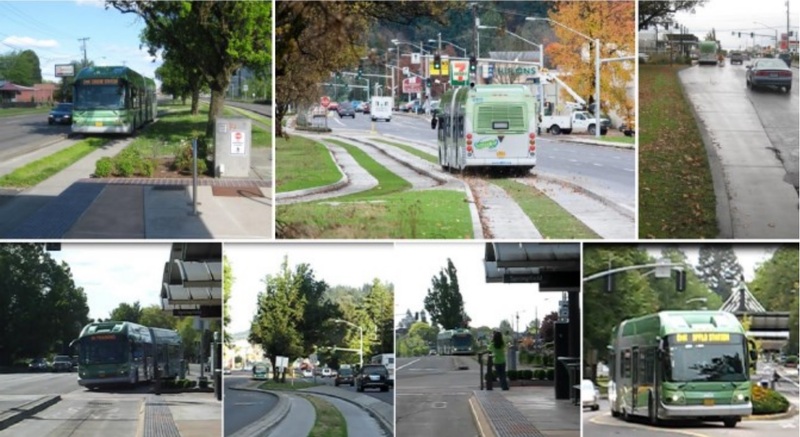 In all three proposals, the Forest Grove and Government Street areas are relegated to using a one-way 136 bus service. This will provide a one-way service every 15 minutes or better, but as I (and hopefully you also) know from TransLink’s guidelines on good route design, one-way services usually aren’t very cost-effective, nor are they in any way optimal for mobility at the end of the day. So what should we do, anyway? 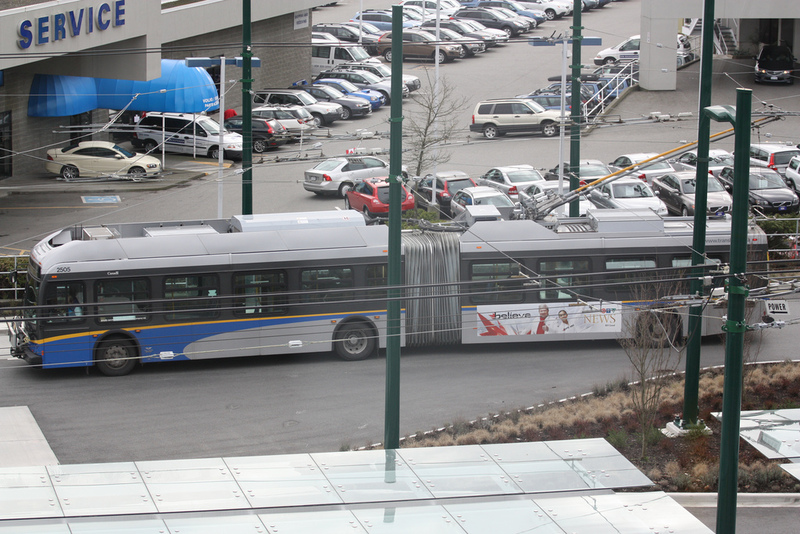 I agree – there’s a lot of room for improvement in Burnaby’s bus transit network. Mike’s proposal shows us that by pursuing a more Vancouver-styled network based on intersecting routes in straight lines, better frequencies throughout can be achieved. Kyle’s proposal also shows us that by simplifying the skeleton, we can make vast improvements to service frequencies. I do, however, think there’s another important question we need to ask before trying to proceed with anything, that being: Is Burnaby ready for a modified network? Some of these ideas can be carried forward. Kingsway/12th Street residents (especially those between Edmonds and 14th) coud benefit from a straight route that offers more direct connections to major anchors such as the growing Edmonds Village and Community Centre, Tommy Douglas Library, and Nikkei Japanese Cultural Centre. Straight north-south connections, so long as connections to places like Burnaby Central Secondary aren’t affected, could help residents better and faster connect with SkyTrain service and regional centres. #28 riders could probably live with the longer walk to the bus stop in favour of a straighter and more direct service on Boundary, and a route down Royal Oak Street north of the station would be absolutely great for riders. Optimizations for increased frequency always help. However, the current network is actually doing fairly well. As I mentioned earlier, cost per boarded passenger decreased – but did so at a lower rate compared to other areas of Metro Vancouver, exceeded by only the North Shore area where it rose 1.2%. Nevertheless, at $1.33/boarded passenger, this is still the second lowest cost of any area in Metro Vancouver, defeated only by Vancouver itself. That means that the current bus network is nevertheless working: the amount of passengers attracted to each bus justifies the costs better than in many other areas of Metro Vancouver. The community consultations for the recent route 49 changes were popular, that would have resulted in the end of a longtime service detour to Champlain Heights that has existed since before the Expo line was built, and before the route even serviced Metrotown in Burnaby. More than 150 stakeholders showed up to the Metrotown consultation centre in protest of the change that would have seen 49 Ave service remain on 49th rather than detour in Southeast Vancouver to service the Champlain Heights area, seen by many planners, riders and myself as a barrier to ridership and reliability on the route. The pre-Expo Line detour costs riders 5 to 10 minutes, mostly affecting riders from Metrotown heading to points on 49th, Langara College and the Canada Line SkyTrain and Richmond. These stakeholders cited heavy ridership in Champlain Heights as well as the service needs of many seniors in the area as reasons to keep the current 49 arrangement – and I believe they had legitimate concerns. A good friend of mine who I work with in organizing the Northwest Fan Fest event lives on 49th west of Champlain Heights, and was among the more active opposition of the 49th change. While the end of the detour would have also allowed the route to become more efficient resulting in an increased frequency for the riders who face daily pass-ups on the 49 (the 49 has the highest pass-up rate of any bus route in Metro Vancouver), the City of Vancouver ended up voting unanimously against the change, with the introduction of a motion by Councillor Geoff Meggs – meaning crosstown 49th travellers are, so far, out of luck. It’s important that there is an active discussion with the community before any bus route changes are made. Many of the proposals sought forward by individuals like Mike and Kyle or by TransLink itself in any finalized concepts could be shot down in favour of established and subjective needs. At the end of the day, while there’s a lot of room for improvements, I think we’re going to have to be careful to ensure that in the end, both connections are improved and everyone is happy with the new service. Impressive growth in Metrotown has created its most impressive skyline ever. More is coming in the Brentwood area and throughout Burnaby. Everyone hates the name, whips them around, and places insubordinate amounts of blame on them for rather small-scale issues; the PR team gets put through no-win scenario after no-win scenario, and the many of us on the sidelines paying attention to the region’s transit issues are starting to become worried, given this public perception may be key in the face of an already-gloomy looking outcome for a transit expansion referendum later this year. In short, TransLink has become a tarnished brand. It has seemed for a long time that there are few people, if any, out there who are able to see the good that TransLink does or has in place for us (one example: we in fact collectively pay less up-front at the farebox than other large cities in Canada for our transit); and, many times I’ve pointed out many times how twisting of important data creates that inability. However, there are some instances I have noticed, which are not ensured by any sort of twisted data, that just befuddle me and make me wonder what in the blazes is going on. An example in particular that’s on my mind right now? The Georgia Straight report by Stephen Hui on the recently announced 2014 TransLink service optimization [CLICK HERE]. TransLink also plans to make frequency and service improvements along busy corridors across the system. These improvements will be implemented over the course of the year during regularly scheduled service changes in April, June, September and December. Notice how the first change on the list suggests that a badly needed service improvement on Surrey’s overcrowded 502 route is the top priority. Such a prospect should have come hand-in-hand with cheers, good feelings, and “finally!” letters to the editor; however, the writer does not give any readers the opportunity to celebrate, simply failing to mention these positive service improvements. It doesn’t come as a surprise for me, because this won’t be the first time I’ve pointed out the Georgia Straight and its authors for what seems to be a biased, anti-TransLink view. And, assuming I am right about such a motive, it’s a very clever move on their part. The writer approaches the topic with neutrality and objectivity, not spinning the article with any obvious viewpoint, but readers are likely to make up their own spin anyway because they see only neutrals or negatives, and do not see the omitted positives. It’s not just the Straight, either. I’m sure most of you remember the time last year when the media (especially TV media) converged on TransLink for doing as any other company would by providing coffee to its employees. So, to the media gurus out there with the competence to possibly provide me with an answer… I’d like to ask you a question. Why is there such a need for TransLink to be seen by the public as the bad guy?